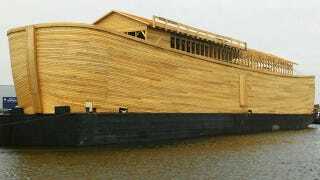 Dutchman Johan Huibers decided to build an ark. Not a Lego or popsicle stick model, but a real-life replica of Noah's Ark built to scale. He began his work in 2008 and recently finished this $1 million project. The wooden ship is immense. It weighs 3,000 tons, is 450 feet long and holds 1,500 passengers. It's so big, the pine boat needs a steel hull for reinforcement. Besides people, there's room for two live chickens and some replica animals for effect.